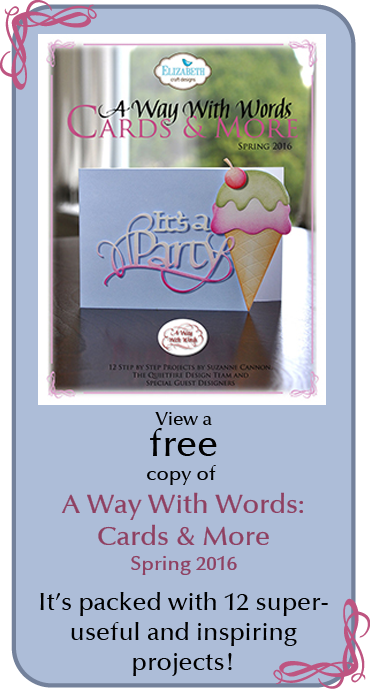 I'm using one of the A Way With Words die set from Elizabeth Craft Designs "Thinking Of You" also available on Quietfire Design HERE. 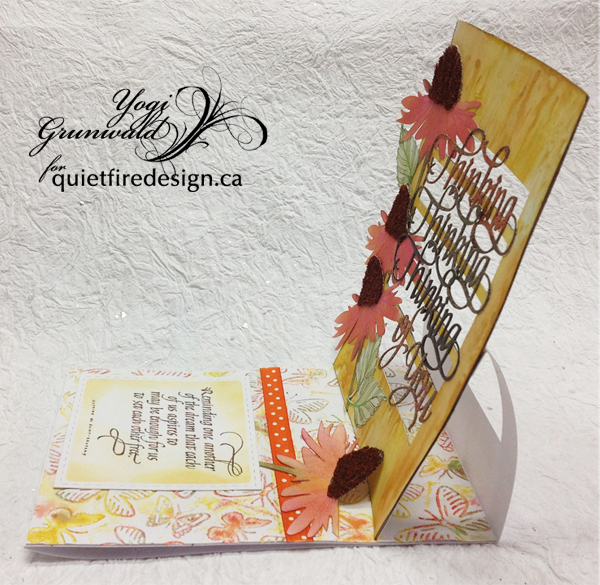 ("Reminding One Another..."); Silhouette: "Coneflower"
Die cut my words Thinking Of You (on Quietfire Design HERE.) from white cardstock. Inked with Versafine "Vintage Sepia" and embossed with Emerald Creek Embossing powder - top one with a touch of "Thanksgiving" and "Chic Camo"; 2nd one down with just the chic camo; 3rd one down with "Oil Rubbed Bronze"; and the "of You" same as the top one. Pounced acrylic daubers on my craft sheet (Mustard Seed", "Scattered Straw" and "Wild Honey", misted generously with water and smeared a 5" x 7" piece of white cardstock through the paint - just once to avoid muddying the colors... Dried. Placed my words on the background and penciled in where I wanted my narrow horizontal strips to land, then cut the openings. eCut the coneflowers (4 of them) from white cardstock. Sponged the flowers with "Picked Raspberry" then some "Mustard Seed"; the stem with "Forest Moss" and the cone head with "Ground Espresso". Applied glue to the extra cone head piece and sprinkled with flower soft "Earth". Pressed the flower soft into the glue and set aside to dry. Used a pink colored pencil on the front flowers to delineate the petals and a scoring tool on the floor flower, then adhered the dried cone to flower. Adhered the flowers to the front layer. Then adhered the die cut words. Stamped the leaves (Designs By Ryn "Hibiscus") inking the stamp with Mowed Lawn" and a touch of "Forest Moss". Fussy cut around it (I created another eCut file - I'm lazy...), adhered to front. Scored and folded my white card to create the easel. 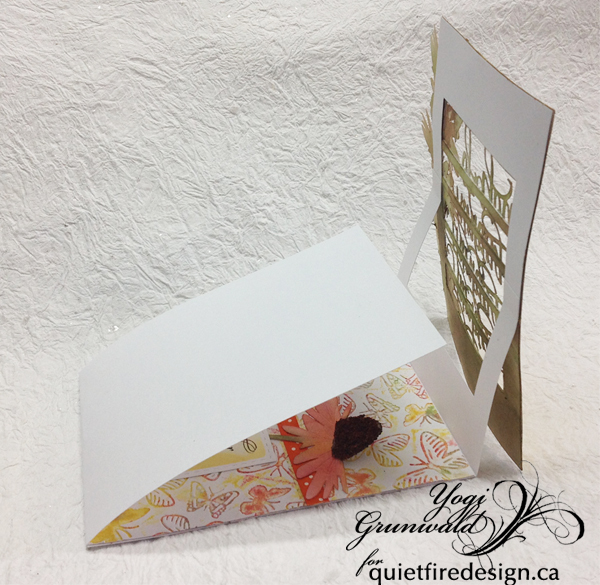 Placed my front over the card and penciled in the opening, cut away and then adhered my front piece to the card front. On the back of the front piece, sponged with "Shabby Shutters" and then "Tea Dye"
On the floor: Cut a piece of white cardstock and embossed the butterfly background (Craft Concepts "Wings") inking the folder with the mustard seed all over and here and there with the raspberry and "Cracked Pistachio", misting with water and embossing. Repeating to cover the whole cardstock. Adhered to floor. Adhered a piece of orange/white polka dotted ribbon. Adhered the 4th coneflower as a stopper. Stamped the quote (Reminding One Another...) on white cardstock inking all over with the Sepia and here and there with Black Soot. Clear embossing. Die cut with Stitched Rectangles (Elizabeth Craft Designs), moving the die cut to cut a square shape... If you have the square set - all the better. Sponged with the mustard seed around the edges. Adhered to card floor. As a final touch, I wanted a white background for when the card is closed, so adhered a piece of 5 x 8.5" white cardstock to the back of the card , scoring at the 7" point so it folds back when card is opened. See pics below. just love those coneflowers! so Pretty!